Serving as the headquarters for the United States Department of Defense, The Pentagon, is the largest office building in the world, with more than six million total square feet of space, including corridors that stretch 17.5 miles. Completed in 1943, The Pentagon has been the logistical hub for all U.S. Military operations for more than five decades. This oval-shaped coin commemorates The Pentagon's central role in protecting the American people and defending America's interests throughout the world. The obverse features a detailed rendering of the Pentagon against the backdrop of an unfurled American flag. The reverse depicts the seal of the Department of Defense in full color. Minted in a brass alloy and coated with an antique finish, this coin is imbued with richly colored enamel accents on both sides. 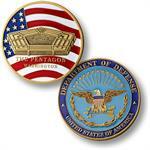 Each coin comes packaged with a header card that describes the Pentagon in full detail.